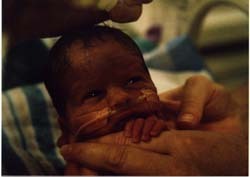 I’ve often been asked to say a few words about my experience as a mother of a premature infant. It’s not a short story but it’s worth the read if you want to get an inside view of one parent’s view of the NICU (neonatal intensive care unit). My husband and I live in Montreal, Canada. Our son was conceived in a Petri dish (not very romantic but after 8 miscarriages there was no choice) and carried by a gestational surrogate mom in California. Throughout the pregnancy we flew back and forth between Montreal and California for doctors’ visits, which included ultrasounds. It was during one of these visits that we were told that the placenta was low-lying. It was VERY hard to get the OB to say that there was a total placenta previa. He kept hemming and hawing about it, as did another OB. It was hard to tell until week 29, when it was confirmed the hard way. We had come for another ultrasound and the very next day our surrogate went into preterm labor. Lots of blood, lots of labor. Fortunately with medication, she was able to hang on until 32 weeks. We rented an apartment and prepared for what very well could have been ... the worst. We bought a big calendar, pasted it to the refrigerator and each night at midnight we crossed off another day...another day closer to our child’s potential survival. The whole time our surrogate was in the hospital we were assured that the hospital could handle a premature birth and had a special team available. Actually the team was at another hospital several blocks away. My husband and I received a call on the morning of Sept. 17, 1999 informing us that we were about to become parents and to get ourselves down to the hospital. This was not a joyous call for us. We started counting on our fingers exactly how many weeks and days it had been and a feeling of dread overcame us. We got to the hospital within 15 minutes of the call only to be told to sit outside the maternity unit. Turns out our surrogate’s regular OB was at a seminar and his associate, a female OB, had taken over the case. She was not friendly toward surrogacy at all and this was her way of showing it. 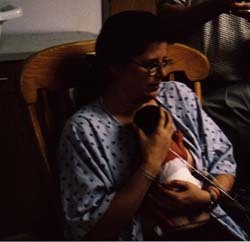 We were left outside, excluded, as our surrogate underwent a C-section. With placenta previa there was no way that she could deliver vaginally. Only her husband was allowed in. We were very disappointed to miss the birth of our first and so far only child. 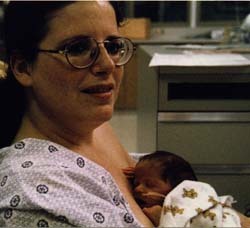 There would be no birth story, no pictures, and no putting baby to the breast as soon as it was born. But these were small matters at the time. There were lives at stake...our baby’s and our surrogate’s. So we sat, and we waited, and we waited. Our families waited in Montreal. The surgery was over by 9:17 am but absolutely no one came out to tell us if our son was alive or dead until 1 pm that afternoon. It was agonizing to say the least and when they finally came out to talk to us there was a flurry of activity. Before we could even see him we had to settle all kinds of paper work. Finally, we were allowed in for a moment. He was being worked on. It had obviously taken a long time to stabilize him. He was on a respirator. His head was being measured and footprints taken. When I asked for a copy there was a whole discussion and finally they gave me one. I took a couple of photographs without flash and my husband took some video and then the doctor in charge asked us to leave so that they could insert lines into the baby’s navel. This is because his tiny hands and arms were too small for intravenous tubes. We had 3 minutes with our son. If I hadn’t taken the pictures I wouldn’t have remembered those 3 minutes. I think I was in shock. We were then told that this hospital could not accommodate our son’s special needs since he needed to be on a respirator for more than 6 hours and that he would have to be moved to another hospital with a level III neonatal intensive care unit (NICU). We had been misled. Our tiny son now needed to be transported by ambulance. Luckily the team from the other hospital had been called and were already in place when our son was born. 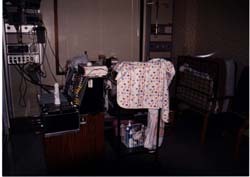 Once our son was safely inside the transport unit, which is a special incubator device equipped with a respirator and pulse oxygen and heart monitor, we insisted that it be wheeled to our surrogate’s room so that she could see that our son, who she so desperately tried to carry to term for us, was ok for the meantime. It was a great source of relief to her. The team left and the doctor told us not to come to the hospital for a couple of hours so that they could set everything up over at the other hospital. We did what we were told. We did not feel like parents. We did not feel an instant attachment. We did not feel joy. We were so terrified that our son was going to die that we did not feel anything but fear and grief. Tears ran down my cheeks all day. We went for a bite to eat. We knew that this was going to be a long day. We had no idea what was in store for us. Let me backtrack just a bit. When I found out that my surrogate was pregnant I contacted Dr. Jack Newman in Toronto to find out if there was a way for me to be able to breastfeed. He suggested a high dose birth control pill, Ortho 1/35, together with domperidone 20 mg 4 times a day. I started this protocol 7 months before our baby was due. No pumping. No herbs. Just pills. Within 10 days my breasts went from a B cup to a D cup and by day 12 I could express clear drops. Dr. Newman was very happy but cautioned me to leave my breasts alone so that the milk making apparatus could develop. As soon as our surrogate went into preterm labor I began to pump with a Medela “Pump in Style” double electric breast pump every 3 hours. I pumped and stored breastmilk in 1 oz portions. By the time our son arrived 3 weeks later I was pumping 16 oz per day. When we arrived at the hospital’s NICU we were met by several people. It was a blur. The doctor told us what to expect, that our son was on a respirator (which we knew) and a lot of things I could not take in at the time due to extreme fear. The social worker was there for emotional support. We were led to our son’s area of the NICU. 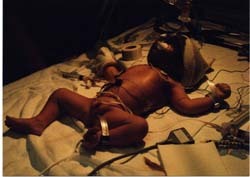 He looked so tiny and helpless lying there with the respirator tube in his mouth and the umbilical lines. There was another line in his forehead because they needed another vein and his little hands were too tiny to get a vein from there. He was not moving except for his tummy, which kept going up and down with the sound of the respirator. There were a lot of machines. He was lying on an open isolet. He looked like he was going to die. After we scrubbed up, my husband and I were encouraged to go over to our little boy and touch him. We were worried that touching him would hurt him but the nurse reassured us that it was ok. We each took a hand. His little fingers closed around each of our pinkies. It was a reflex but we felt that he knew we were there. I choked back my tears and began to hum to him and tell him that mommy and daddy were there and that we would never leave him, that he was safe, that we loved him, that we would take care of him. I wished him a Happy Birthday. We stayed all together like that for a very long time until we couldn’t stand any longer. We stayed with him until midnight and then we went back to our apartment for the night. It would be the last night my husband and I would spend together for several weeks. Mercifully our son was only on the respirator for 24 hours because he had received steroids in-utero and lung surfactant at birth. 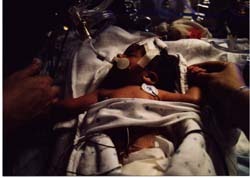 Once the respirator was removed and a nasal canula placed instead to deliver supplementary oxygen, they were ready to talk to us about tube feeding. Everyone knew that our son was born via surrogacy so right away out came the artificial infant milk...I announced to anyone who would listen that I fully intended to breastfeed but everyone naturally assumed that I meant that I was going to breastfeed with the help of a supplementary feeding device...tubes at the breast. When we spoke initially with the doctor I explained the protocol that I had done and finally ended up lifting up my shirt and squirting breastmilk at him so he would understand (ya gotta do what ya gotta do sometimes). I ended up having to repeat this procedure again and again in order to get the message across that I did indeed have breastmilk and that there was no way my son was getting artificial infant milk. Battle number one, won. I also called my surrogate and requested collostrum. She was able to express 1/2 oz of collostrum before her doctor ordered a blood transfusion and told her to stop pumping. We mixed the collostrum with a little of my breastmilk and fed this mixture to my son via feeding tube for the next 4 feedings. Then he received my breastmilk alone. By that afternoon the hospital decided to allow us to hold our son skin to skin. They explained the value of Kangaroo Care to us and my husband and I took shifts holding our son 18 hours per day. Periodically I would bring his tiny head to my breast and express a little milk onto his lips. 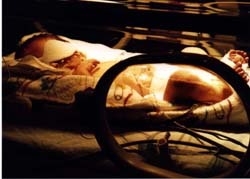 On our son’s third day of life his jaundice was so bad and his bilirubin so high that he had to go under the bililights in a covered isolet. That evening I gave him his first sponge bath. I started to feel more like a mom and less like my son was going to die any second. That evening our surrogate and her husband arrived from the other hospital. She was in a wheelchair because she was in no condition to walk around after the C-section. I encouraged her to do Kangaroo Care with Adam and left her and her husband alone with the nurse so they could say goodbye to the pregnancy and Adam properly. Leaving that room was one of the hardest things I’ve ever had to do in my entire life but it was a good thing to do for my surrogate, and for Adam’s sake later in life. I stayed outside until they came to get me about a half-hour later. My husband and I took our son out from under the bililights every chance we got and did skin-to-skin, Kangaroo Care. I tried to put him to my breast everyday. One of the nurses worked diligently with me. On the ninth day he latched! We did two breastfeeds the first day and then alternated between breast and preemie bottle because the hospital insisted that our son was too weak to breastfeed each feeding and we believed them. Luckily, he went back and forth without a problem until I could breastfeed him exclusively. 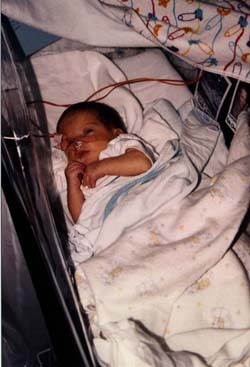 I never used a feeding tube device. Pumping my breastmilk became my most important mission next to holding my son as much as possible. I knew that these were two things that I could do to keep him alive. It kept me going. It gave me hope. I knew that providing breastmilk was more important now than ever. I pumped like crazy. My favourite place to pump was right next to my son’s isolet. I was able to get the most milk that way. There were lots of outlets. I just plugged in, put on the hands free kit and that was that. And my milk supply went up and up. There was a fridge right there in the room if the milk wasn’t going to be used right away. After breastfeeding my son for two weeks with only my own breastmilk the hospital told us that we needed to give our son human milk fortifier because of his prematurity. They decided either to let me breastfeed but to chase the feed with a bottle of fortifier OR to give breastmilk and fortifier mixed 50:50 in a bottle. 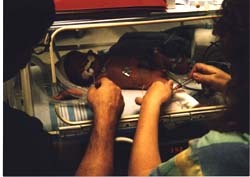 Then after another couple of weeks they wanted me to give him half preemie artificial infant milk and half breastmilk. I did not know better. I was still afraid that something terrible would happen. And they informed us that unless he gained adequate weight, they could not release him from the hospital. We did not argue. There was no point. As time went on we got into a routine where my husband would take my breastmilk to the hospital in the morning and stay with my son so that I could get some sleep. I would go at lunchtime and stay until 2 am. We often spent supper together during the shift change and spent the evening as a family. My husband would leave at 11 pm and I would stay until I couldn’t keep my eyes open anymore. We held our son the whole time. The routine was helpful. The nurses patiently showed each of us what to do and how to take care of our baby. They took pictures of him with a Polaroid instant camera so that we could see how he slept while we were at lunch or dinner. They took pictures of us and put them in his isolet on either side of him so he could see us when we weren’t there. I often say that this was the best parenting course we could have had. My husband took to this like a duck to water. We started to think about the day our son would come home. We did the CPR course at the hospital twice. We bought a little bassinet and a foam changing pad. We bought little preemie clothes and started to dress him up at the hospital when he wasn’t skin to skin with us. About two weeks into all of this our son finally left the intensive care nursery for the “step-down” area where we had our own room. My husband and I had to leave for an hour twice a day during the staff shift changes. At some point when we were not with our son a nurse who we did not know went into his room and gave him opium. She had mistaken our well-cared-for baby who was in the biggest step down room in the unit...for a drug baby!!! Fortunately she realized her mistake and did a gavage procedure, but still....they only told us a week later. I started to worry that the hospital was going to kill him if the prematurity didn’t. It was a terrible fright. Throughout our stay at the hospital we constantly asked when they thought our son would be going home. They would always say something like “next week” or in a few days when they knew full well that it would be at least a month and maybe 6 weeks. As reasonably intelligent people, my husband and I resented this. My mother kept asking me when she should come and I never knew what to say. I finally told her to come after I was told our son would be released in another week. She came. Our son ended up staying in the hospital 3 more weeks. This put unnecessary stress on the whole family. After two weeks with no end in sight, my mother left to go back home and be with my dad whom she had left behind. Because of the hospital’s policy of stringing the parents along, I didn’t have my mother’s help when my son was finally released from the hospital. It was very difficult for us to plan anything. Our family and friends wanted to welcome our son and celebrate his homecoming but we never knew when we would be going home. The truth would have been much more helpful. All through the experience I worried that my son would not be normal. I felt terribly guilty that I couldn’t carry him myself but reminded myself that the babies I had carried had all died, and so my son was in fact much better off. I mourned the stupid silly things like the baby shower we didn’t have, the nursery that wasn’t set up yet, being far away from all the family who could come to visit and coo over the baby. Fortunately the community was wonderful. They took us into their hearts. They had us over for dinner and lots of them came to the hospital to coo and fuss over our baby. They brought little stuffed animals and made a big fuss over how cute he was, jaundiced, shaved head, lines sticking out all over. They made us feel like “normal proud parents.” We started to see our son through their eyes instead of as a patient to take care of. Finally the day came for our son to do his “sleep study”. This was 10 hours straight monitoring with us out of the room. Our son could come home if he did not have significant apnea episodes. He failed. A week later the test was repeated and he passed but he would have to come home on a heart apnea monitor just to be safe. A technician came to see us and to explain how it all worked and how to change the leads and where to place them. The next day we were discharged. We said tearful goodbyes to everyone and exchanged emails and addresses. 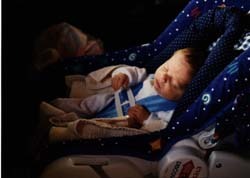 We put our baby in his infant car seat. He was so small we needed blankets all around his head to hold it there. I stayed with him in the back seat as my husband drove (crawled) to our apartment at 10 mph with the hazard lights flashing. We saw a paediatrician one week later and were cleared to fly home. Our surrogate and her family came to say goodbye and to help us load our car with all the things that we had accumulated over the three months that we had been in California. The new friends that we had made during our stay, came to say their goodbyes. We left the next day. Our son pooped on his father and then threw up on him twice during the flight home. The pilot gave us special permission not to turn off the heart apnea monitor, which had a 12-hour battery. When we got to the airport at home, our family was there with a banner that said “Welcome Home Adam” and there were balloons on the front door. They made a big fuss over Adam. Our son’s official homecoming celebration was a week later. My husband had written a letter one night while sitting next to Adam’s isolet in the NICU. He read this letter at the party. It was a letter to his son, Adam, telling him about his mother and the great lengths she had gone to in order to breastfeed him and give him the best possible start in life. He told Adam how proud he was of me and how one day we would tell him the story of his miraculous birth. I went on to breastfeed Adam until he was 8 months old and 20 pounds. At my peak I brought in 32 oz per day of my own breastmilk. 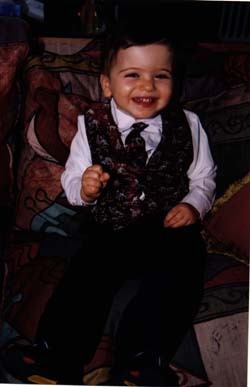 Today Adam is 2 1/2 years old and he suffers no ill effects from his prematurity. In fact, he’s physically and intellectually advanced. I’ve never told this story before in such great detail. I hope that by telling it you can glean from it what you can do to help parents who are faced with the arduous task of taking care of a premature child and the emotions that go with it. I think the most important thing to remember is to support the parents in a way that makes them feel like “normal parents”. Fuss and coo over the baby. Encourage the mother to breastfeed and to pump her milk. If they are far from home, offer to have them over for dinner. Take pictures of them to put in the baby’s isolet. Take a picture of the baby for the parents to keep at their home or hotel room. Encourage them to touch their child, do Kangaroo Care. But most important of all, tell them how wonderfully they are taking care of their baby. Breastfeeding Adam at 4 months, I never used a feeding tube device. © Lenore Goldfarb, B.Comm, B.Sc, IBCLC, November 2002. All rights reserved.